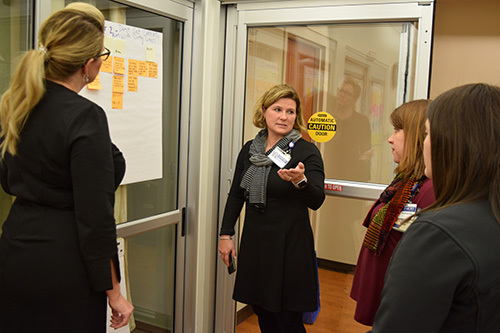 A team of Winship staffers including frontline nurses and administrators came together last week to take on the challenge of uncluttering the ambulatory infusion center at Clifton campus. 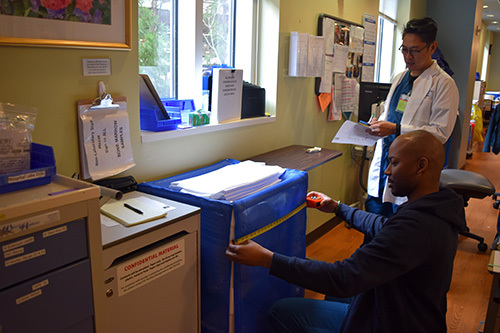 Jesus "JB" Belonio, Jr. of the ambulatory infusion center at Clifton campus and Quincy Lamar Jackson of Emory Saint Joseph's Hospital measure the linen bins. Infusion center nurses, Elsie Sims of Emory University Hospital Midtown and Elisabeth Taylor of Clifton campus with Clinic Operations Administrator Katherine Wright of Winship Cancer Institute. 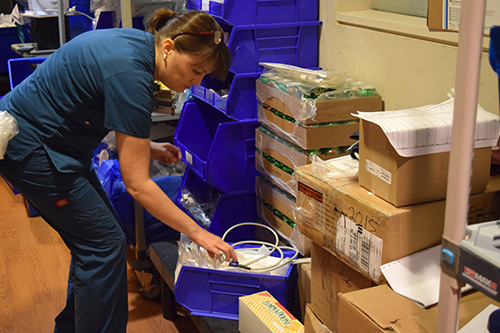 Infusion center nurse Dana Clark of Clifton campus sorts through the supplies. 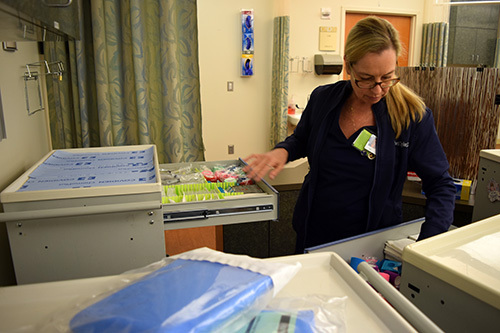 Infusion center nurse Elisabeth Taylor of Clifton campus organizes supplies in the infusion bay carts. Winship's Vice President of Cancer Services Melissa Childress reviews the plan with members of the project team. Winship Executive Director Walter J. Curran, Jr., MD, receives an update on the progress of the project. 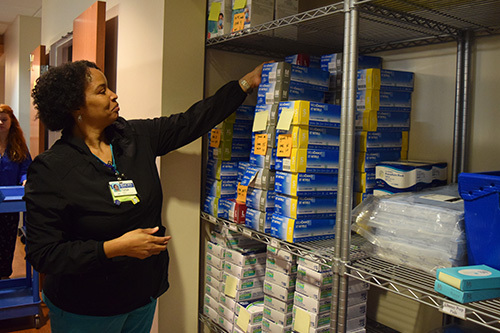 Infusion center nurse Tonya Colston of Emory Johns Creek Hospital puts the finishing touches on the supply cabinet. Reorganized supplies are ready in the cabinet. It's great to start from scratch to build new hospital and clinic spaces. But how do you rework an existing space to function and feel better? Anyone who's ever de-cluttered a house knows how hard it is to throw out old stuff, create more space, and then keep it uncluttered. 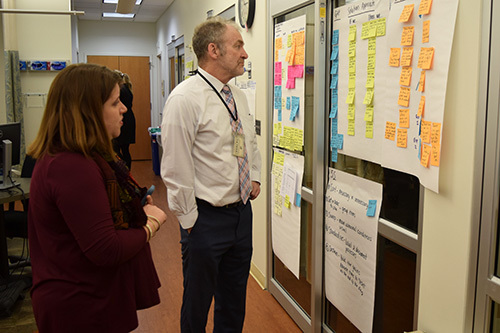 A core team of ten people, including frontline nurses and administrators, came together last week to take on that challenge in Winship's Ambulatory Infusion Center (AIC) on Clifton Rd. 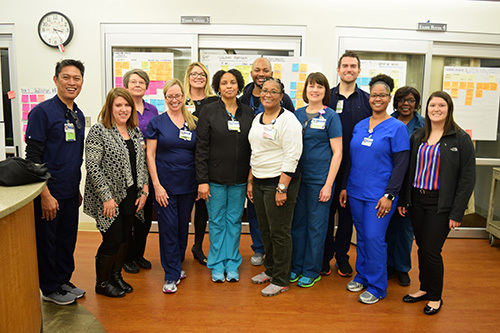 The team was made up of staff who work at the AIC on Clifton, plus staff who work at Emory University Hospital Midtown, Emory Saint Joseph’s Hospital, and Emory John's Creek Hospital. The week started with guidance from Simpler Consulting's Shannon Allen, who laid out the principles of Lean Methodology being used throughout Winship: decrease the storage footprint and manage waste more efficiently in order to create a better work flow and a visually calmer, more pleasant atmosphere. A key concept of the process is to have the problem tackled by the people who actually work in the spaces. The staff from other hospitals are expected to bring the process back to their own infusion centers. The project, dubbed MESS – which stands for Methods, Equipment, Supplies and Safety -- was spearheaded by Winship clinic operations administrator Katherine Wright, and Catherine Parker, unit director of the AIC. Wright says she was inspired by the Netflix show, Tidying Up, and has been using their tips to get her own house in order and to explain some of the concepts to staffers. Wright and Parker teamed up with Shannon Allen, who provided the organizational structure to make it happen in the AIC. The group divided up into pairs to measure and assess the facility's three main areas -- supplies, linens, and waste. After a day of counting and measuring waste bins and supply carts, and digging excess supplies out of closets, the team calculated what would be needed in each treatment bay and how to efficiently provide those resources. On day three, they put their ideas into action, tweaking the ones that didn't work, and on day four, they looked at their work and asked “did we get it right?" Because there's generally a lot of inefficiency in ordering and storing supplies, the process stresses a "just in time" supply management system that keeps adequate supplies on hand but doesn’t stockpile excess supplies. An interesting result of the week-long activities was the uncovering of many supplies that other clinics can use. 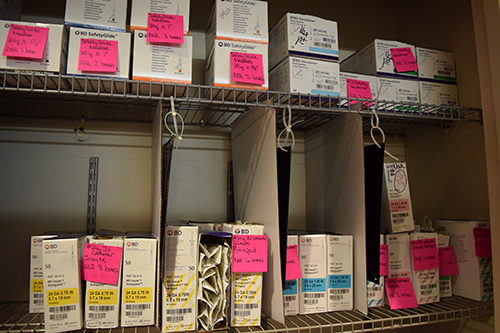 The work continues, and Wright hopes to have these new principles in place before major renovations begin, like moving the pharmacy into the old Phase I unit and creating new work stations for the nursing staff. 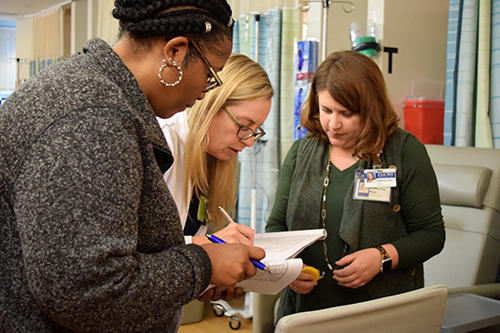 Vice President of Winship Cancer Services, Melissa Childress, is overseeing changes throughout Winship's facilities: "This system will help us create a better environment for patients, caregivers, and staff in all of our clinics."